With the emerging infrastructure development across the urban center, the Outer Ring Road Chennai (ORR) is yet another milestone in the metropolis. The major target of this Chennai ORR project is to avoid clogging in the city and heave large urban vacant areas for the commercial and residential developments. 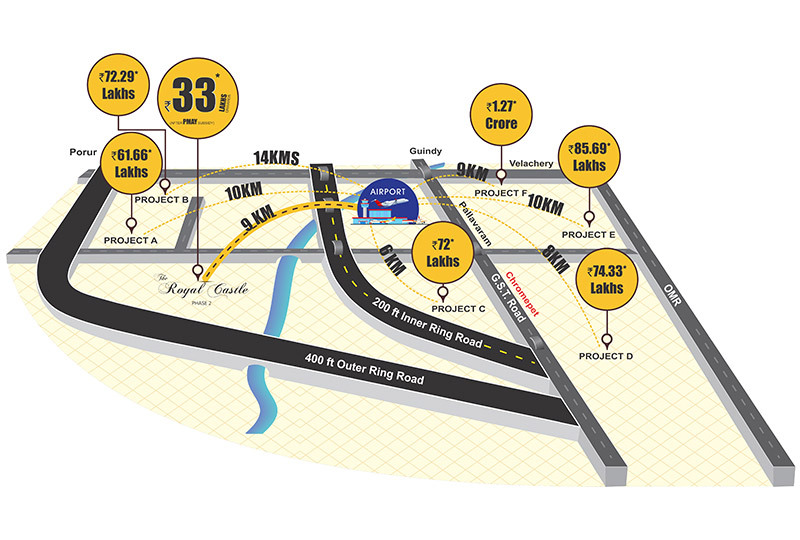 This multi-modal transport corridor is totally 62kms in length and it joins the western periphery of the city. The 400 feet outer ring road connects Vandular in the South-Western Edge with Minjur in the northerly edge of the city. Further, the other major areas that the road passes through include Nazararathpet (NH-4), Nemillichery (NH-205) and Padayanallur (NH-205). These connectivity advantages will make the real estate in Outer Ring Road Chennai to get boomed in the consequent years. Adding to it, the Government has planned to further the infrastructure developments in the surroundings with Bus Terminus projects and more commercial developments. Therefore, buying a property in ORR Chennai is the ideal choice for the property investors. The professionals from the real estate industry reveal that the capital appreciation of the properties near ORR Chennai has increased remarkably in the past 3 years. By understanding the scenario, the real estate developers have constructed many residential properties in ORR Chennai for sale. Moreover, the properties in ORR Chennai will witness further price appreciation, as there are lots of proposed commercial developments in pipeline. As Chennai ORR has easy access to the major industrial corridors and IT hubs, the working professionals prefer to rent or buy residential properties near Outer Ring Road Chennai. These major factors will increase the demand of residential properties in ORR Chennai. Thus, the properties for sale in ORR Chennai are the best choice for property investors to get greater returns in the future. Further, the price of a residential property in ORR Chennai is reasonable when compared to the residential property prices in the major places of Chennai. This is another driving force which has grasped the attention of the property investors. Besides, most of the residential properties for sale in ORR Chennai are located in a serene location, which makes the residents to live in a peaceful environment without any hustles and bustles. However, the serene location is very difficult to be found in the major places of the city with this price tag. These advantageous reasons have captivated the property investors to invest in a residential property near ORR Chennai.